It is always a pleasure to review a new WA-built boat, especially one built in fibreglass: this is almost an endangered species. The builder, Shockwave, is already known for its highly capable cats – think Cockburn and Fremantle Sea Rescue – but the Classique range of trailer boats is a newer venture. 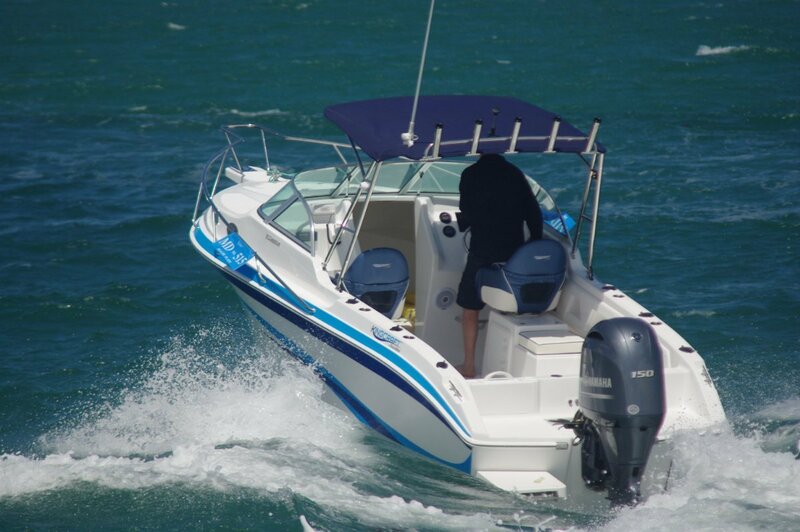 The review Kingcraft 21 cuddy, locally designed, is unquestionably aimed at all the local boating pursuits. One of the striking internal non features is the absence of a rear settee. Some research by the builders suggested that this is an item low on most boaters’ wish lists. Far more popular is sheer space, and does the 21 ever have that. 6.5 metres is a biggish boat by current standards, and a large share of that is available for anglers or divers. The permanent seating comprises a pair of swivels on lockers, and jump seats aft of them. The lockers under the swivels have forward facing doors; the lockers below the jump seats are top loading and insulated – here are the containers for lunch and drinks. It is uncommon for a trailer boat to have more than four adults on board, and for bigger numbers bean bags (if you can still find them) make a good drop in. Young children would probably be delighted to have the run of the cuddy. With the in-fill in place between the V-berths, there is an upholstered platform level with the cockpit ideal for indoor games. Underneath the infill is space for a chemical toilet. This is a well lit compartment with ports as well as a clear fore hatch. The driving position has been well worked out. Actually sitting in the seat the eye line is mid way up the curved windscreen. Leaning against the bolster it is way above it. These two positions illustrate Shockwave’s point of view when asked about the possibility of clears; essentially it is “Why?” Sit down and there is no breeze (or spray); stand and you get all the breeze you could want, and that is surely part of the reason for being on the water. The long answer is that anything is possible, but it would be sad to mar the beauty of that cantilevered Bimini. It is carried on a Targa and its associated frame that was superbly fabricated locally in stainless steel. Stainless is something small Western Australian producers do particularly well. Even the stainless footrests are a work of art. A bank of rocket launchers completes the Targa. 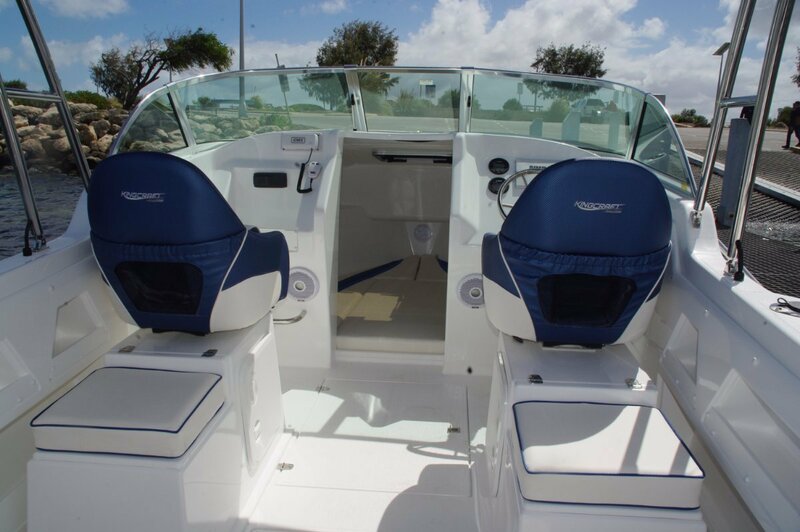 The Kingcraft is not big on doors, which can be fragile things and tricky to repair; the two underseat lockers account for the full complement. A place where they might have been is in the transom. Instead the items there that need periodic checks are in full view, but still neatly stowed: filter and batteries. Yes, plural; always a good clue to how hard the builder or dealer is trying. 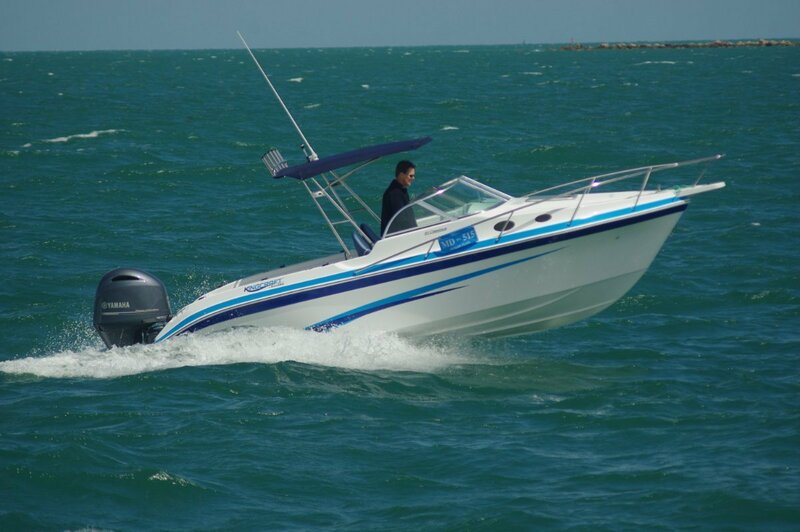 The 21 has suggested power from 150hp to 225hp, supplied in our case by a 150 Yamaha. It is probably good for 35 knots, and we came close to that on the review day. It was a day designed for masochists or boat reviewers: a superabundance of wind and sea. Which the Kingcraft did better than cope with - it mastered it. It has the presence that some fibreglass boats show, feeling bigger and heavier than they actually are. The motions were nicely modified, the ride better than acceptable, and the quietness very welcome. The Kingcraft’s abundant open space fits the boat for a full range of activities, and Shockwave have kitted it out with most of the items for the big one – fishing. Amidships is a catch tank of 120 litres, which could also be an extra icebox for picnic days. Additional to the rocket launchers are six coaming rod sockets, and the long side pockets would also take rods. Not an exclusively fishing item are the deep sides, but more than welcome for anglers’ thighs and by mothers concerned with children’s safety. Fishing makes the most mess so the salt water deck wash is another for the list. As is the Simrad plotter-sounder. The Kingcraft Classique 21: an all-rounder worth a closer look.